To the extent that I appear in public at all—for example, by writing books, or even simply by the existence of the gathering of My devotees in this world—My visible Role can only be that of Prophet. I do not serve people's random needs to be fulfilled, to be consoled, to be fascinated. Every individual who is moved to Realize Real God, Truth, and Reality in My Avataric Divine Company must approach Me as My formally practicing devotee—and, in every such case, the usual egoic process will (and must) be Offended, Criticized, and Undermined by Me. As the Avataric Incarnation of the Very Divine Person, I must be Paradoxical, I must be Free—in order to Serve the Divine Liberation of My devotees. The qualities of My Avataric Divine Activity cannot be predetermined. I do not consistently assume the qualities of any particular archetype—the holy man, the Yogi, the Sage. I must be Free to Appear as I will. I am always Acting to Undo the egoic life of My devotees—even if only by Merely Being Who I Am. I Call My devotees to understand that the Real Spiritual life in My Avataric Divine Company is not identified with any particular qualities, tendencies, or preferences. Thus, I Call My devotees to drop all the armor that people tend to take on when they think they are turning away from the world of suffering and toward the Truth. Religious or Spiritual seeking is not the Way to Truth. No remedial (or strategic) path is the Way to Real God. No experiential process directly (or in and of itself) Realizes Real God. Only present-time Divine Communion is the Foundation of genuine religious and Spiritual life. All the strategic paths to God are merely seeking for God. All forms of seeking for God are ego-based—not Real-God-based. No such strategic (or merely seeking) path can ever serve the crisis of "radical" self-understanding. Therefore, My devotees must be purified not only of their ordinary self‑indulgent and irresponsible habits, but also, equally, of their accumulated notions of "spirituality". Real God is not Realized by mere experiences, or by the fulfillment of prescriptions, moralities, or presumptions about how things are, were, or will be. In My Function as Prophet, I must always find ways to Undo people's illusions. In Satsang with Me, the crisis of self-understanding is an entirely individual process for each of My devotees. 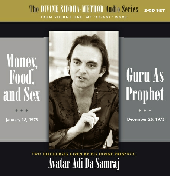 There is no end to the variety of conditions that may arise at one moment or another in the life of Satsang with Me. Therefore, life in My Avataric Divine Company cannot be predetermined. It cannot be fixed or ritualized. Satsang with Me is a living Condition in Which I Draw My true devotees to Myself, so that the Real Spiritual process may then come alive, through My Siddhi of Avataric Divine Spiritual Self-Transmission.